Census Bureau To Test How Citizenship Question Affects 2020 Census Responses The bureau wants to know if it should hire more workers and adapt marketing for the 2020 national head count because of any negative impact from a citizenship question. 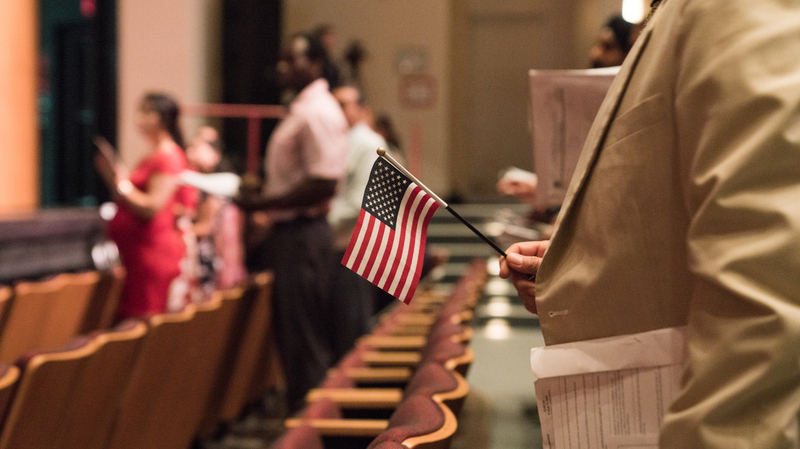 Newly sworn-in U.S. citizens stand during a naturalization ceremony in Alexandria, Va., in August. The Census Bureau is planning to test how a question about U.S. citizenship status the Trump administration added will affect responses to the 2020 census. The bureau expects to receive results by fall 2019. That's just months before the head count is expected to begin in January 2020 in rural Alaska before rolling out to the rest of the country starting in March of that year. Officials say they are trying to figure out whether the agency needs to hire more door knockers to visit households that don't respond and adapt its marketing campaign for the census because of any negative impact from the citizenship question. "We're doing this purely for logistical purposes," explained the bureau's Acting Director Ron Jarmin during a public meeting of the Census Scientific Advisory Committee. The announcement comes at a precarious period in preparations for the constitutionally-required head count of every person living in the U.S. The Trump administration is facing a total of seven lawsuits over its addition of a citizenship question that dozens of states, cities and other groups fear will undermine the accuracy of the information collected for the census. The population count will be used to determine the distribution of congressional seats and Electoral College votes among the states through 2030, and how an estimated $800 billion a year in federal funds are allocated for Medicare, local schools, roads and other public institutions and services. During Thursday's meeting at the bureau's headquarters in Suitland, Md., Jarmin noted that the agency has "pretty limited reliable evidence of what the impact of the question will be on self-response rates." Opponents of the hotly contested question, including former Census Bureau directors, have criticized the lack of testing of a 2020 census questionnaire that includes the citizenship question. Commerce Secretary Wilbur Ross, who oversees the Census Bureau, announced his approval of the question in late March after the agency had started its only practice run for the 2020 head count. A citizenship question was not part of the questionnaires households in Rhode Island's Providence County used for the test run. Ross has said the question is "well tested" because it's been asked on the bureau's American Community Survey, which federal law requires about one in 38 households to answer every year. But for the lawsuits over the question, attorneys for the plaintiffs in the two lead cases based in New York are arguing in part that Ross misused his authority by adding a new question to the 2020 census without considering the need for additional testing. The plaintiffs' point to standards set by the bureau and the White House's Office of Management and Budget that require changes to survey questionnaires to be tested. Justice Department attorneys, who are representing the Trump administration in these lawsuits, argue that the Office of Management and Budget could require more testing of the citizenship question before it approves the proposed 2020 census questionnaire, which the Census Bureau plans to submit to OMB by the end of this year. Plans for a potential test of the citizenship question in the summer of 2019 were first announced publicly in November during the trial for the lawsuits in New York. The bureau's announcement on Thursday confirming the test is not expected to affect the final district court ruling for the New York-based lawsuits, which U.S. District Judge Jesse Furman has said he plans to release in the next few weeks. Furman said in court that in forming his opinion, he is focusing on any testing of the citizenship question conducted before Ross announced his decision in March to add the question. Earlier Census Bureau research suggests asking about U.S. citizenship status during a climate of increased immigration enforcement and rising anti-immigrant rhetoric is likely to discourage households with noncitizens, including unauthorized immigrants, from taking part in the census. Preliminary results from focus group research commissioned by the bureau found the question to be a "major barrier" to participation among groups the government considers to be the hardest to count.